Product #22170 | SKU SBAC-UT100 | 0.0 (no ratings yet) Thanks for your rating! High speed transfers from SxS PRO+ and SxS-1 cards with dual slots and daisy-chain operation. Read speeds of approx. 360 MB/s for two cards simultaneously from latest SxS Pro+ and SxS-1 cards using Thunderbolt 2. Connect up to 6 units, providing up to 12 card slots, allowing simultaneous ingest up to 1800 MB/s total (300 MB/s each slot). The SBAC-UT100 can also be used with XQD media in combination with the XQD adapter (QDA-EX1). For example, content recorded with the PXW-FS7 camcorder on XQD media is compatible with UT100 only if housed in XQD adapter. The unit has 2x Thunderbolt 2 (TB2) interface for high speed transfers up to 360 Mbps for dual slots simultaneously and, in daisy-chain operation with six units (12 card slots), up to 1800 Mbps (300 Mbps each slot). 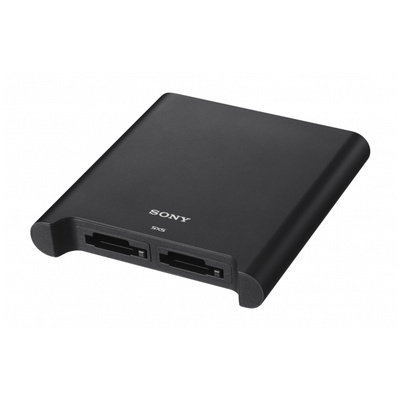 The SBAC-UT100 provides high speed transfer of audio/visual material from a SxS PRO+ or SxS-1 solid state memory card using an USB 3.0 interface, allowing you to make transfers when your computer does not have an ExpressCard slot. The device also provides compatibility with USB 2.0.